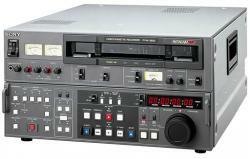 Its compatibility with BVW series Betacam SP products and peripherals make it an easy way to upgrade current systems. It features built-in TBC, built-in TC generator/reader, full editing control facility, 90 min record/playback, 24 times picture search, RS-422 remote interface, Y/C input/output and component video (Y, R-Y, B-Y) inputs/outputs. 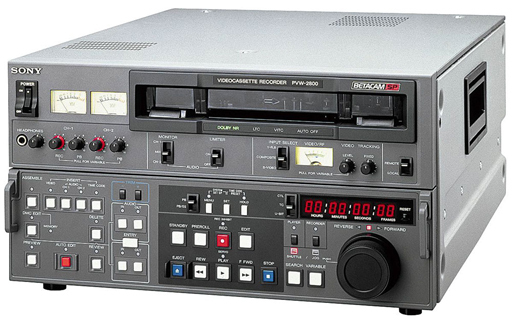 It records on metal particle tape and will playback any Betacam or Betacam SP recorded tape. ?RS-422A Serial Interface (9-pin) Provided for versatile editing system expansion and flexible system control. ?High Quality Audio Thanks to the tape speed of the format and the adoption of the proven Dolby C-type NR, the PVW-2800 offers high quality audio with a wide dynamic range even at high frequencies, minimum distortion and excellent S/N ratio. ?Longer Playback Time Both L-size and S-size cassettes are accepted, giving playback times of over 90 minutes and over 30 minutes respectively. ?Built-in Time Base Corrector A superior quality output video is obtained directly from the PVW-2650, with no additional time base correction required. Advanced high quality digital dropout compensation also ensures consistent picture performance. ?TBC Remote Control In addition to the built-in TBC adjustment of the PVW-2800, remote adjustments may be performed using the optional BVR-50 connected via the D-sub 15-pin cable to the real panel connector (TBC REMOTE). ?Detachable Control Panel Can be tilted at up to 90 degrees. Alternatively, the control panel can be removed from the machine to provide remote control from a distance of up to 5m by using the optional BKW-2010 Control Panel Extension Kit and BK-803 Control Panel Case. ?19-inch EIA Standard Rack Mountable With the optional RMM-100, the PVW-2800 can be mounted into a 19-inch EIA standard rack without taking off the side panel. ?Tape speed - GENERAL: - 11.86cm/sec. ?Differential phase - VIDEO PERFORMANCE: - MPT:Less than 3? OT:Less than 3? ?Y/C delay - VIDEO PERFORMANCE: - MPT:Less than 20nsec. OT:Less than 20nsec. ?Processor adjustment range - SIGNAL OUTPUTS: - Video level?3dB Chroma level?3dB Setup Level0 to +15 IRE Hue?15? System SC phase360?p-p System sync phase+3 to -1?sec. Y/C delay?50 nsec.